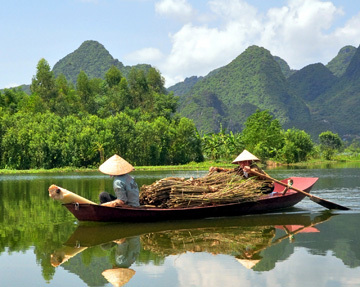 If you are looking to explore the region around Ho Chi Minh, then join this tour which will take you to Mekong Delta, a rich fertile region in Vietnam. 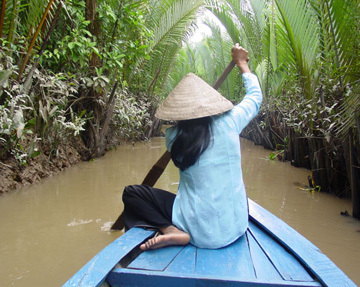 Tour takes you through orchards, canals and swamplands of Mekong Delta. A Comma shaped flatland stretching from city limits of Ho Chi Minh to the Gulf of Thailand, is a rice bowl of Vietnam. Apart from rice, the region is famous for coconuts, fruits and sugar cane. Reach at Saigaon Opera House (Municipal Theatre) at 7.30 am as the coach will depart at 8 am to My Tho, a port city on the Mekong Delta. Around half of Vietnam's total agricultural output comes from this amazingly fertile delta. Life of locals and villagers revolves around rivers and canals. Upon arrival board a private boat for a cruise along the river. Visit an island with lush tropical gardens and try out a tropical fruit accompanied by a traditional music performance. Tour will continue to another island to see coconut candy being made. We have a chance to visit local villages in the area and learn more about traditional lifestyles, culture and customs. Go by Xe Loi (motorized cart) to an apiary where you will be transferred to smaller rowing boats going deeper into the narrow canals. Diem Phuong Restaurant provides lunch. The guide will provide some advice on the finer points of local cuisine. After lunch return to Ho Chi Minh City. Return transfers to Mekong Delta by air-conditioned vehicle. Boat transfers in Mekong Delta, Visits to Orchards, Visit to Coconut Candy Center and Apiary.